Today we read "Money, Money, HoneyBunny!" by Marilyn Sadler and Roger Bollen. 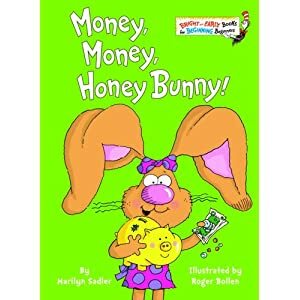 This is a cute rhyming book about how Funny Bunny uses her money. Aubrey is really into rhyming right now so she enjoyed that part of the book and I like that it gave me a chance to start talking about money with her. After reading the book, I created a little "store" for Aubrey to shop at. I took some of her toys and put little price tags on them. Once I set up the store, I gave Aubrey a handful of pennies. Then, she got to shop! She picked out what she wanted and then had to count out how many pennies she needed. After she "bought" all of her toys, she decided to make some of her own price tags! That is her sweet attempt at making a cents sign. Love, love, love it!! I have a feeling we will be playing store a lot the next couple of days. Aubrey loved this activity!